US, 1950, 87 minutes, Black and white. Kirk Douglas, Virginia Mayo, John Agar, Walter Brennan. 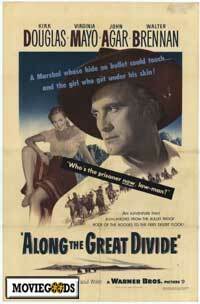 Along The Great Divide is a routine but interesting and enjoyable western directed by veteran Raoul Walsh. After a long and distinguished career in the '30s, Walsh made quite a number of westerns but never attained the status of the films he made earlier. Kirk Douglas is a strong hero and is well supported by Virginia Mayo and Walter Brennan in a familiar kind of role. The film is strong on themes of law and justice in the west. 1. The quality of this film as a western? 2. The use of western conventions: the lynching situation, the status of law, the role of the marshal, the pursuit in search of truth, romance and justice? How well illustrated? 3. The importance of the locations, the atmosphere of the desert and the mountains, the title? 4. Audience response immediately to the lynching situation and the victim? The film's use of audience feelings for its themes? 5. The status of the marshall and his upholding of the law, his strength and his understanding of justice? His non-emotional involvement in justice? His protection. his relationship with his friend, his skill in getting the group through to the town? A typical man of the West? 6. How well did the film explore themes of law, justice, the rigidity of the law and bending the law? The importance of the marshall's story about his father, its influencing his behaviour, the temptation to change? Humanity versus justice? 7. The presentation of the old man as a victim of the lawless West? As a pioneer, with cattle, a man of the West. His rustling and yet being framed for murder? His attempts to escape? The human side, especially with his daughter? His taunting the marshall and parallelling himself with his father? How important was this father-son theme? 8. The role of the daughter in the film? Her attempts to help her father, her not knowing the truth, her antagonism towards the marshall and change of attitude, was her falling in love inevitable? 9. The importance of Billy? His relationship with the marshall? The pathos of his death? 10. Roden as the typical big rancher, the vengeance feelings in the West? The immediate execution of justice? Was he a just man? His relationship with his sons and causing resentment? His responsibility for his son's death? 11. How interesting and important the visualising of endurance in the desert etc, the crises, betrayal, persevering in the task, deaths? 12. How accurate was the presentation of the court and its determining of justice? The collage of evidence? 13. The role of the watch for them and resolution? How melodramatic? Appropriate for this film? 14. How successful the film as an entertaining western? As a thoughtful western on themes of justice and the nature of the men of the West?